In every ANPR / LPR system it is a critical issue to provide consistent images of appropriate quality level. FXCAMd series is all-in-one digital camera family dedicated for number plate recognition applications. The FXCAMd 102 is a B&W camera with synchronized IR illuminator, ideal for both moving traffic (motorways, enforcement, congestion, etc.) and access control (parking management) applications. Due to the IR illuminator works at an undetectable bandwidth for human eyes, there is no disturbance for drivers. The effective range is up to 20 meters (65 ft) but it may vary depending on the specific environment. FXCAMd 102 cameras are available with different input/output port configuration (trigger in, trigger out, serial RS232) to fit your requirements. 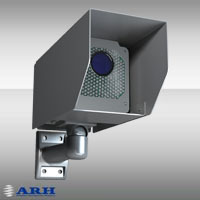 OEM solutions, customized cameras are also available on request.